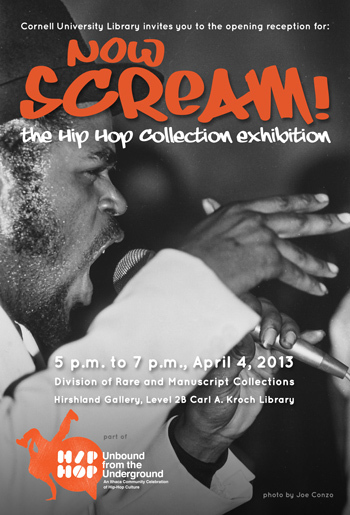 The Hip Hop Collection at Cornell University wants to include YOU in the Now Scream Exhibition! If you wanna be down, there’s only 6 days left!!! We’ve already received pics & quotes from China, Brazil, Greece, Kazakhstan, Wales, Saskatchewan, Oakland, Ithaca, and the Bronx, among others!! We want YOU to participate in our major Hip Hop exhibition, which will be on display here at Cornell University April 2013-February 2014! We’re creating a section of the exhibition featuring the worldwide Hip Hop community. We want you to email us a photo of you participating in Hip Hop Culture somehow (by doing one of the elements, by wearing Hip Hop fashion, etc.) and brief quote – 1-4 sentences – explaining how Hip Hop influenced you and/or your community, and/or what Hip Hop means to you. The photo can be from present-day or an earlier part of your life. We want people of all ages, backgrounds, and geographic locations to participate! We’ll pick our favorites and add them in our gallery for all to see! To submit your contribution, please send your photo (highest resolution possible) and quote to CornellHipHop@gmail.com no later than March 31, 2013. But earlier is better, nahmean? Make sure to include your name as you want it displayed and what city, country, and other identities you represent. Hip Hop = Community. PEACE, and thanks in advance! For more information, click here.